“If anyone serves Me, he must follow Me. Where I am, there My servant also will be” (John 12:26). A couple of weeks ago, I drove my daughter to a doctor’s appointment that she was dreading. On the way there, she talked about how difficult it is to make yourself do something that you know must be done but that you also know will cause you pain. It may be something that results in our own good, but at the moment, all we can think of is our immediate desire to avoid pain. I could relate to her dilemma and silently recalled situations that had caused similar emotions in my life. We all know the feeling—it has to happen, this painful thing, but fear or self-preservation makes the journey there a very difficult one. It would be so easy to run the other way and ignore our situation. But some things just can’t be ignored. Jesus knows how we feel. Even as he rode into Jerusalem, even as the people cried, “Hosanna,” and blessed his name, even though he knew it was the right thing to do, Jesus felt the burden of his impending suffering and said, “Now my soul is troubled” (John 12:27). Can you imagine? Who would, who could choose to suffer in such a terrible way? It’s rare that someone will choose to die for someone else. And then it’s usually because of the goodness of that person. But Jesus chose to die for those who would revile him—for the very ones who would cause his suffering (Rom. 5:8). While we were in revolt against him, he chose to die for us. It must have been the longest journey of his life, a slow, clip-clopping ride on the back of donkey’s colt, each rocking step taking him closer to pain. Oh, he would face one more such journey with a heavy plank across his bleeding back, but this one was the first step to death. And he was willing to take it, because he knew that some things, things like God’s justice and the wages of our sin, simply can’t be ignored. It was why he had come to this hour. It was his purpose to reconcile us to the Father, to pay a debt many of us don’t even recognize that we owe, and to die so that we may live. “Father, glorify your name,” he cried. How? By crushing your Son. Do we yet understand the cost of sin? That Jesus Christ who knew no sin during his life on earth actually became sin so that the justice of a Holy God would be satisfied? From Adam to us, the curse has been passed down. Each one born in sin, then choosing to sin and desperately trying to ignore the truth of our situation. Thinking that God understands our weakness. He knows that we are trying to do better. Surely God won’t judge us for acting like everyone else. And isn’t sin just an old-fashioned term that the world has long outgrown? After all, God is patient, God is loving, and God will forgive. But God is also Holy. He hates sin and has declared that the wages of sin is death. Try as we may, we can’t ignore this truth. Painful though it may be, we can’t serve two gods at the same time. We have to make a choice. Will it be God or will it be Self? As Jesus said to Philip and Andrew on the day of his arrival in Jerusalem, “The one who loves his life will lose it, and the one who hates his life in this world will keep it for eternal life. If anyone serves Me, he must follow Me. Where I am, there My servant also will be” John 12:25-26). Where was Jesus when he spoke these words? On the road to the cross. Where will we be when we choose to follow him? If we truly value the price he paid, if we comprehend his sacrifice and recognize our guilt, then we will join him at the cross. Yes, everything in us revolts against the pain of the cross. Yes, we will do almost anything to keep from dying to ourselves. Yet, that is where our Master leads. If we love him, we will follow him—even to the cross. Hosanna to the King of Kings! “Then Moses asked God, ‘If … they ask me, ‘What is His name?’ what should I tell them?’ God replied to Moses, ‘I AM WHO I AM’” (Exodus 3:13-14). For the past two days, I’ve been involved in coach training at the Tennessee Baptist Convention. This course was the fifth one I have participated in so when I wandered into the classroom on the first morning, the leaders called to me, “Hey Coach Lisa!” They know how hesitant I have been to accept the title, and they were teasing me more than a little. (Funny guys, huh?) But I also knew they were affirming me and the fact that I have recently completed my requirements to be certified as a Christian life coach. Their support made me smile although I still hesitated—and even blushed a bit—to accept the title. But, they are right. I am a coach. And despite the fact that I haven’t wanted to claim the name before receiving the credentials, it’s not really the certificate that makes me a coach. It’s the fact that I am coaching. The same is true for any title. I am a mother because I have three grown children who recognize me as “Mom.” When they need a little mothering, I’m the one they come to. I function in that role—it’s who I am. I’m also a writer. When I give people that title, I’m often asked what I’ve had published. Even as I give them the information they are looking for, I know it’s not because I’ve been published that I am a writer. It’s because on almost every Thursday, I sit down at my desk and write. Again, it’s who I am. When God gave a name that would identify Him to His people, He called Himself “I AM WHO I AM.” It was a name that was big enough to express One who was more than they could comprehend. Who was God to the Israelites? He was the God of their fathers, the God of Abraham, Isaac and Jacob. He was the One who called Abraham out of Ur and promised to make him into a great nation. He was the One who heard their cries for deliverance. And He was much more that they would discover—their Way through the waters, their Provider in the wilderness, their Cloudy Shelter from the sun, their Fiery Pillar of direction, their Judge, their Protector, their Deliverer, and so much more. He saw them, He knew them, and He made it so that they could know Him in return. God’s name was not given to Him–it was Him. I AM WHO I AM. So … who are you? Rich man, poor man, beggar man, thief, doctor, lawyer, merchant, chief? Not the most politically correct list perhaps, but you get the picture. What is your real name? Are there parts of you that have not yet begun to live? Are there good works, new titles even, that God has prepared for you but for some reason—lack of credentials, fear or other insecurities—you have yet to accept? Are you being all of who you really are? For many of us the answer to that last question is, “No.” In fact, some of us may not even know our true names. But God knows. He has knit us together, gifted us for service, and given us each a name to live out. As the image bearers of I AM WHO I AM, we are becoming who we are. He qualifies us by the blood of Christ, certifies us to serve, and seals our credentials by His Holy Spirit. We are called by His name. Christians! We are who we are—with our whole hearts, let’s fully be it! “The Lord turned to him and said, ‘Go in the strength you have …’” (Judges 6:14). Every time I read through Judges, I am grabbed by the story of Gideon. The irony of the situation just screams. A “mighty warrior” discovered by the Angel of Lord hiding from his enemies in a wine vat in order to thresh his wheat. Covered with chaff, starting in fear, yet a “mighty warrior?” Come on now. His weakness is so apparent that I’m surprised that even the Angel of the Lord didn’t have to fight back a smirk and a chuckle. Poor Gideon, the youngest in his father’s house and from the weakest family in Manasseh. Warrior? Right. Yet, he goes into battle. In the strength he has. Or rather in the strength he hasn’t. He goes, and God gets the glory. Paul shares a similar story. When faced with a difficult situation of his own, he pleads with the Lord to take it away. Three times he begs, but God replies, “My grace is sufficient for you, for power is perfected in weakness” (2 Cor. 12:9). Paul learned to take pleasure in his own weakness, because he discovered Christ’s power would reside in him when he couldn’t handle life on his own. And Paul faced it all: weaknesses, insults, catastrophes, persecutions and pressures (12:10). Yet, when he was weak, because of Jesus, he was strong. Obviously Gideon and Paul aren’t the only ones who need God’s strength. We all have more to bear than we can carry on our own from time to time. Financial struggles. Relationship issues. Natural disasters. Physical illness. Depression. Loneliness. The list goes on and on. And, if we are honest, we all can admit to wanting to hide at least occasionally. We may not have a wine vat like Gideon’s, but we find other ways to conceal our labor. Maybe we bury ourselves in work or sleep or medication. Maybe we paint on a happy face and just pretend that everything is okay. Or maybe we just give up all together. But just as it was for Gideon and Paul, God’s grace is sufficient. He is always strong, and He is always able to carry the load. He’s just waiting to be asked. Are you like Gideon? Are you afraid to crawl out of your hiding place? Are you frightened by the real dangers you face? Jesus’ perfect love will cast out all your fear. Ask Him. Let Him show you how to go in the strength you already have in Him. Even covered by the chaff of fear, you are a mighty warrior when He sends you out. His ultimate victory is assured, and you can go anywhere in Him. Are you like Paul? Are you suffering from a thorn in your flesh? Is your pain making it hard for you to make it through another day? Ask Him for grace. Ask Him for power. Let Him show you that when you are weak, then you are strong because of Jesus Christ. You, too, can learn His sufficiency to meet all of your needs. Gideon, Paul and each one of us—we are “mighty warriors” in Him and His grace is sufficient for us. What will it take to go in the strength we have? Is He not sending us? 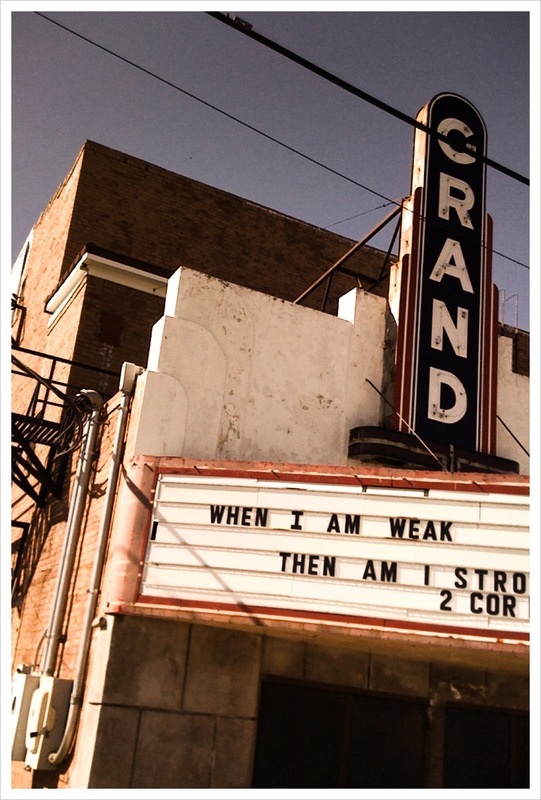 The message is clear: we are weak, but He is strong. And it’s time to go! “You are to help your brothers until the Lord gives them rest, as he has done for you, and until they too have taken possession of the land that the Lord your God is giving them” (Joshua 1:14-15). They were on the verge of receiving what God had promised. The nation of Israel was preparing to cross the Jordan River and head into the Promised Land. But strangely enough some of them were not going to make the trip. The Reubenites, the Gadites, and the half-tribe of Manasseh had asked to stay on the east bank. God had agreed with the provision that the men of these tribes would still help their brothers take the land to the west. As they approached the river, Joshua reminded them of their promise. “Your wives, your children and your livestock may stay in the land that Moses gave you east of the Jordan, but all your fighting men, fully armed, must cross over ahead of your brothers…. After that you may go back and occupy your own land” (Joshua 1: 14-15). It was enthusiastically agreed upon by the two and one-half tribes, and they promised to fully obey Joshua as long as they were sure that the Lord was with Joshua as He had been with Moses. They signed up to lead the charge into Canaan wholeheartedly. The truth is that I like being comfortable. I like sitting in my cushy chair in my cozy office and studying. I like reading my books, writing my thoughts, and then comfortably settling back to ruminate on what God has revealed. New learning, new thoughts, new revelations of Him are my Promised Land. And even though I sometimes feel as though I am single-handedly fighting giants by trying to comprehend the truths of God, my life is a comfortable one, and my body, if not my mind, is at rest. God is gracious to grant me an amazing inheritance of Truth. The question is what am I doing with it? If, like the Reubenites, the Gadites, and the half-tribe of Manasseh, I have been given land to possess, am I required to do anything in return? Should I still be engaged in the battles of my spiritually younger brothers and sisters? Should I live in isolation with the gifts God has given or should I be doing something to help others? Should I, in fact, be right at the front of the battle leading the way? The answer to that last question seems unavoidable. Yes. Yes, I need to help my fellow travelers along the way. As much as I hate to leave the comfort of my home, as much as I fear to lead, as much as I long to stay behind, yes, I must do it. Those east bank men were enthusiastic and willing to go. They left wives, children, livestock, comfort, and safety behind. The danger they faced was very real and very bloody. Yet, they knew that God was leading the way, and that was all they needed to know. It isn’t really different today. There are still dangerous battles to fight, difficult challenges to overcome, and opposing enemies to face head on. Life is hard. But it’s even harder if you don’t have God to follow or if you’re a new believer who isn’t yet sure how to follow. What are we doing to help our brothers and sisters until the Lord gives them rest? Our answers matter to those who are waiting for what God wants to give them through us. We are called—commissioned even—to lend a hand. Are we willing to lead the charge?